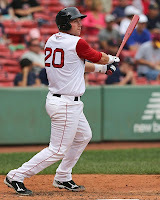 The Red Sox have promoted David Chester from Low A Greenville to High A Salem. The Bunyan-esque 6-foot-7, 270-pound first baseman was named a South Atlantic League All-Star earlier this season, his first with the Drive. Chester was a 33rd-round selection by the Red Sox in the 2011 out of the University of Pittsburgh after leading the Big East in home runs as a senior. He ranked second in the South Atlantic League with 71 runs batted in, and his .270/.356/.462 batting line included career high totals of 25 doubles and 13 home runs. The promotion will mark Chester's second stint with Salem, as he appeared in seven games there in 2012 due to a roster crunch. In other moves, the rehab assignment of pitcher Matt Maloney was transferred from Lowell to Portland, outfielder J.C. Linares was added to the Portland roster, and Peter Hissey was placed on the disabled list. Maloney, 29, continues to work his way back from 2012 Tommy John surgery. The 6-foot-4 left-hander had five appearances with Lowell, allowing just one unearned run on four hits in 6 1/3 innings. Maloney appeared in 31 major league games between 2009 and 2012 with the Cincinnati Reds and Minnesota Twins.